Puff on - Unusual conditions made for intense racing at the first event of the 2017-2018 Quantum J/70 Winter Series. Photo by Lara Dallman-Weiss. For the last several years, J/70 teams have gathered in Tampa, Florida at Davis Island Yacht Club for the Quantum J/70 Winter Series. The 2017-2018 series began with unusual conditions; a cold front pushed in with winds out of the Northwest sending unstable, shifty air off of the land. 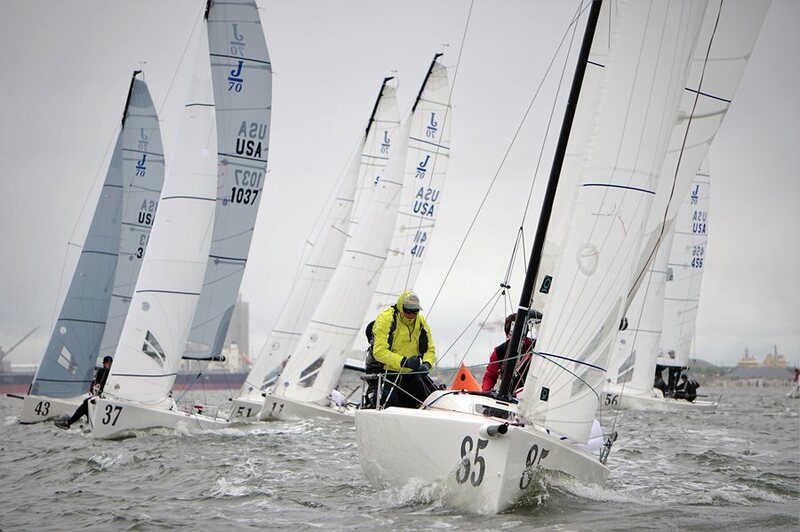 Add in a healthy dose of waves and cool temps and you’ve got yourself an exciting regatta. Quantum’s Travis Odenbach recounts the event and his tips for sailing your J/70 (and other boats) in these types of conditions. In big fleet racing, finding and holding a lane during starts is often a challenge. You need to find the first big puff and shift. These usually come from one of the edges and this event wasn’t an exception. If you can get the edge with the pressure, you can more easily play the puffs from there. When it is time to sail downwind and you’re in the front of the fleet, the best maneuver is to bear away at the weather mark and try to sail at least half of the leg before jibing to cross the middle. If you’re behind, it is often more advantageous to jibe fairly quickly after the mark in order to free up your lane and then play the puffs down to the leeward mark. When it comes time to sail downwind in puffy, big breeze, it’s important you have the right heel angle. For the planing J/70, I find it’s best to sail the boat on a five-degree heel angle and keep the boat planing as much as possible. In these conditions, I often see a lot of boats that are either too flat or too heeled over resulting in sluggish speeds and difficult driving, or boats on the verge of wiping out. Concentrate on heel angle and body weight. This can be the difference between passing or losing boats. Communication is always important, but when the conditions are shifty and unstable it becomes a deal breaker. Additionally, make sure the roles every teammate are clear and understood. Designate a person to count down puffs (five, four, three, two, one – puff on!) to give the skipper time to make the correct adjustments for a puff or lull. There should also be a designated person counting down sets of waves. Bad sets of waves, that is. In choppy conditions, calling all waves can be overkill, but bad sets of waves should be communicated. If everyone is doing their assigned job and communication is clear, the boat should be much more relaxed. Click here to learn more about the Quantum J/70 Winter Series or contact Travis Odenbach with any J/70 questions.